Welcome to the Yacht Bar. First, lets set things straight. If you think the Yacht Bar is a fancy cocktail lounge where Ensenada Race skippers sip martinis after sailing back to Newport Beach, you need to change your idea of what the Yacht Bar is. The Yacht Bar is a snack bar—the kind of place where you can get tasty hamburgers, cheeseburgers, hot dogs, and golden brown french fries. If any of the other guests are skippers of yachts, thats just a coincidence. The “Yacht” part of the name is due to the restaurants proximity to the Tomorrowland Lagoon and its exterior panels that are painted like nautical flags. You should plan on spending around a dollar for a meal. For example, a chili dog is 40 cents; french fries are 25 cents; a piece of pie is 30 cents; and a cup of hot coffee is 10 cents. That adds up to $1.05. How about fresh baked pizza for 65 cents and milk for 15 cents? That adds up to 80 cents. A submarine sandwich is 75 cents; a large Coca-Cola or Pepsi-Cola is 25 cents. That adds up to $1.00 exactly. Yes, you can actually choose between Coca-Cola or Pepsi-Cola. Your other soft drink choices are root beer, orange soda, or grape soda. A small soft drink is 15 cents. Would you rather have a snack than a meal? How about a thick, frosty shake for 40 cents, or popcorn for 15 cents? After you buy your meal, have a seat in a coral-colored fiberglass chair. You wont need to look for a table because each chair has an attached side desk. After all, this is the Space Age, and traditional tables are old-fashioned. The Yacht Bar, which served Disneyland guests from April 1957 until September 1966, was located on the north side of the building that is now Buzz Lightyear Astro Blasters, near the Matterhorn Bobsleds ride. The Yacht Bar building was originally opened as the Yacht Club in 1955, next to the short-lived Phantom Boats attraction. 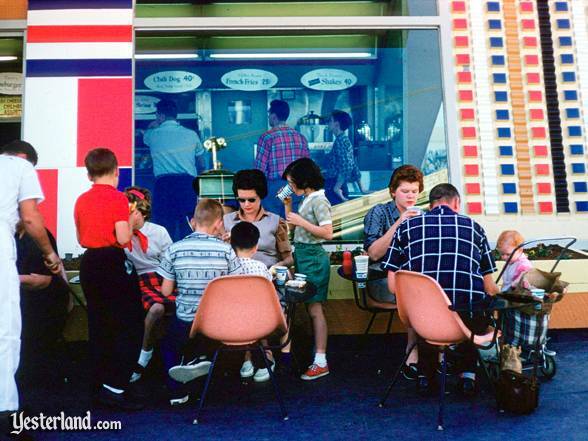 To make way for the Viewliner attraction in 1957, the building was moved, redecorated, and renamed. 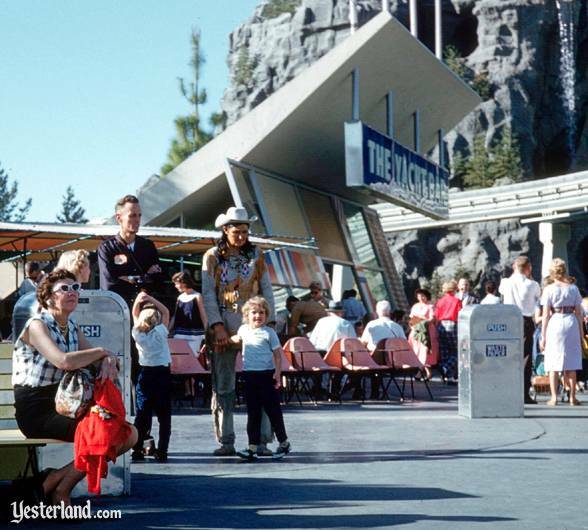 When the New Tomorrowland opened in 1967, the Yacht Bar was gone. Instead, Coca Cola Tomorrowland Terrace, a much larger counter-service restaurant, extended around the CircleVision building from its east side to its north side. Tomorrowland Terrace was best known for the ascending and descending Tomorrowland Terrace Stage. The former CircleVision is now Buzz Lightyear Astro Blasters. The large counter-service restaurant was renamed back to Tomorrowland Terrace in 2006, after being called Club Buzz for several years. You dont have a choice of Coke or Pepsi anymore. The Coca-Cola Company is now the exclusive provider of soft drinks (such as Coke, Diet Coke, Sprite, Minute Maid Light Lemonade, Barqs Root Beer, and Fanta Orange) and bottled water (Coca-Colas Dasani brand) at the Disneyland Resort, Walt Disney World, and Disney Cruise Line. Photograph of The Yacht Bar with Matterhorn in background: Charles R. Lympany, courtesy of Chris Taylor. Photograph of seating in front of The Yacht Bar: Charles R. Lympany, courtesy of Chris Taylor.